Juicy, sweet strawberries picked from your own garden are simply the best. Plus, taking strawberries from your own garden to your plate is so rewarding. Create a berry garden by pairing with blueberries, blackberries and raspberries. The key to growing berries, no matter where you garden, is good-quality organic soil. The first step is to pick the type of Strawberry plant you want to grow. Take the amount of growing time Think about where you’ll plant your berries to get the best results. Visit your local garden center to find the best type of strawberry for you. June-bearing. This traditional berry will usually produce one large harvest in late spring or early summer depending on temperature. June-bearing strawberries are available in early, mid-season and late varieties. Ever-bearing. These scrumptious strawberries produce two to three harvests intermittently during the spring, summer and fall. Because ever-bearing plants do not send out many runners, they make great choices for containers. Day-Neutral. Grow these to keep producing fruit throughout the growing season. They continuously fruit if temperatures are between 35-85°F. Because they produce few runners, they are great when space is limited, but the fruits are usually somewhat smaller than June bearers. Once you’ve picked your plants, it’s time to get them in the ground. Strawberries grow best in full sun and in soil with a pH of 5.5 to 7. If your pH level is too high, add Espoma’s Soil Acidifier for ideal soil conditions. 1. Plant strawberries as soon as the ground can be worked in the spring. 2. Space plants at least 20” apart. Dig holes deep and wide enough to accommodate the entire root system. 3. Plant the crown (the parts of the plant that are above ground) at soil level; firm soil around it. 4. Add compost to bed and encourage strawberries to grow by adding Espoma’s Holly-tone, an organic plant food perfect for these acid-loving plants. Short on space or looking to grow strawberries vertically? Check out how Laura from Garden Answer grows. As evenings become cooler and crisper and the daylight gets shorter and shorter, it’s a signal that frost is not too far away. The change in temperature and season can leave gardeners longing for the warm summer air, instead of prepping for winter. There’s still plenty of gardening to be done this time of year. Get the most out of your fall harvest and set your garden up for spring success by jumping on these garden tasks now. It’s no secret that the best time to plant a tree or shrub is in the fall. Before you plant, evaluate the landscape to assess the amount of sunlight, ground vegetation, proximity to permanent structures, and hazards, such as overhead wires or underground pipes. Choose a site where the tree will be able to grow to its mature height. Then, dig a hole twice as wide and the same depth as the root ball. Place the tree in the hole at the same depth it was growing before and fill half the hole with compost or Espoma’s All Purpose Garden Soil. Mix in an organic fertilizer such as Bio-tone Starter Plus with the soil. Backfill the hole, give it a nice drink of water and watch your tree grow. Spring-blooming bulbs can generally be planted any time before the soil begins to freeze. Give bulbs their best shot by planting a few weeks before the ground is frozen to help them establish roots. Be sure to add in a scoop of Bulb-tone to each planting hole. While fall is for planting, it’s also the perfect time for prepping for next season. Healthy soil is the backbone of every successful garden. Test soil now for pH and nutrient levels and amend accordingly. Dig 4” deep with a stainless steel trowel and either use a DIY soil test or send your soil sample to the county extension office. To adjust the PH level of your soil, use Espoma’s Organic Garden Lime to raise the pH of very acidic soil. Poke holes in the soil’s surface and scatter on the lime. Rake lightly into the top inch of soil. Or, apply Espoma’s Soil Acidifier to lower the pH of extremely alkaline soil. All of those colorful leaves that are falling make for perfect additions to your compost pile. If you don’t have a compost pile already, start one! The best compost contains about 25 times more carbon-rich materials than nitrogen-rich materials. Think of these as brown and green materials. Brown materials include paper, straw or dried leaves. Green materials include garden and food scraps. Add Espoma’s Compost Starter to help speed the composting process, for rich, fertile compost. Add a thick blanket of mulch to reduce evaporation and control weeds. Choose organic mulch that will improve the soil as it decomposes. Lay 2 – 3” of mulch around established plants. When mulching trees, the mulch should extend away from the plant to just beyond the drip line covering a bit of the roots. Keep 2 – 3” away from the stems of woody plants and 6 – 12” away from buildings to avoid pests. If it looks like frost will arrive earlier than expected, protect your crops and extend your growing season by covering with a sheet, blanket or tarp. Use stakes to keep the cover from touching the plants. Looking for an indoor project? Check out this low-light succulent planter from Garden Answer. Summer is a great time to spruce things up, giving you the chance to make your home feel warm and welcoming. If you want to add curb appeal or if your yard just seems a bit bare, plant perennials that will come back year after year. Look for them in many different colors, heights, and forms. Before planting, evaluate your space for the amount of sun and shade it gets. Check to make sure the perennials you’re selecting will thrive in your space. Here are our top six picks for the prettiest perennials. 1. Hydrangeas. There are endless options of these bright bloomers to choose from. Pick a spot where hydrangeas will get afternoon sun and be sure to water daily. For bright blue hydrangeas, you’ll need to perfect the soil’s pH level. Use Espoma’s Soil Acidifier for best results. Zones 4-9. 2. Black-eyed Susan. Black-eyed Susan blooms from midsummer to fall and always makes a strong comeback in spring. This vigorous bloomer is also a favorite of pollinators. These flowers grow best in full sun, but will tolerate partial sun as well. Zones 3-9. 3. Aster. The lovely pink or lavender blooms attract a wide range of late-season butterflies and beneficial insects. Position purple asters against a white picket fence or light colored background for a look that pops. Zone 4-8. 4. Daylillies. Daylilies are just as hardy as they are colorful. Blooming from early spring to late summer, these perennials make the perfect border or road-side addition. Since soil near roads and walkways tends to be in need of a boost, make sure to plant with Espoma’s liquid Start! plant food. 5. Hostas. Choose Hostas for their never-ending display of colorful summer foliage. You’ll find these perennials at your local garden center in a wide variety of colors, shapes and patterns. Plant under trees, near shrubs, or near your home. Hostas prefer shade, but some varieties do well in sun. Zones 3-9. 6. Sedum. One of the most dependable perennials you can grow, varieties of sedum will quickly establish themselves in any sunny spot. These creeping ground covers and low-maintenance plants will also attract pollinators. Zones 3-9. Once you’ve chosen your perennials, all that’s left to do is plant. To get your best perennials yet, use Espoma’s new liquid Bloom! plant food. Don’t let limited space discourage you from gardening. Whether you have a big backyard or a one bedroom apartment, there are always plenty of ways to keep your living space green. If you have a green thumb but not a lot of space, container plants will become your best friend. When growing in containers, be sure to use Espoma’s Organic Potting Soil Mix for best results. Try these ten small space gardening solutions. These delicious summer fruits are the perfect fit for growing in containers. Although they might be small, blueberries provide a ton of nutritional benefits. Potted blueberry plants provide more than just a healthy snack, too – they create beautiful foliage all year long. While certain varieties of tomatoes can grow very large, cherry tomatoes are perfect for small space gardening. Grow cherry tomatoes in a sunny spot on your patio or balcony and pop them right off the vine when you’re ready to eat! Use Espoma’s Organic Tomato Tone for best results. Choose a dwarf or petite hydrangea and the flowers and leaves will fill out the container in no time. Be sure to give hydrangeas plenty of light and water daily. For bright blue hydrangeas, you’ll need to perfect the soil’s pH level. Use Espoma’s Soil Acidifier for best results. Not only are they low-maintenance and easy to care for, succulents are also trending in the home décor world. With a huge variety – including cactus, aloe, sedum and many more – you’re sure to find a succulent you love. Plant in a sunny spot indoors or out and water as needed. Create a windowsill garden and fill with herbs. If you have a sunny spot in your kitchen, you’ll have fresh, homegrown herbs at your fingertips every time you cook. Basil, rosemary and thyme are easy to grow and essential in many delicious meals. When it comes to choosing which berries to add to your organic garden, you can’t go wrong with summer’s favorite fruit — strawberries. Another delicious berry to grow, strawberries can thrive in containers with the right care. Strawberries love sun, so place containers in a bright spot. Keep the soil moist, but keep leaves dry to protect your plants from disease. Before you know it, you’ll be enjoying the sweet tastes of this summer standard. While sunflowers can grow up to 12 feet tall, dwarf sunflower seeds produce much smaller blooms, typically measuring around 1 foot tall. They are perfect for small space gardening, and children love planting these bright flowers. Teach your kids about gardening by starting seeds together, caring for seedlings, and watching flowers bloom. These trees are very stylish indoor houseplants. The deep green leaves don’t grow too bushy, making fiddle leaf figs perfect for small spaces and empty corners. When cared for properly, fiddle leaf figs can grow up to six feet tall. These plants become a dramatic focal point in any room. Keep in a very sunny, warm spot and ensure the soil is well-drained. Indoor houseplants have been proven to reduce stress and improve air quality. Peace lilies are one of the best providers of these benefits. Besides the health perks, peace lilies also provide beautiful bright white flowers contrasted with deep green leaves. Peppers are another edible perfect for small space gardening. Some peppers can even be grown on your kitchen table or counter. There are hundreds of varieties, so whether you live for the spice or prefer mild sweet peppers, you’ll find one you love. Peppers are typically compact and thrive in containers. Specific care may vary depending on the variety. Ready to plant? Check out Garden Answer’s video on planting fruits and veggies in containers. Nothing says summer like the fresh taste of homegrown fruit. Berries are becoming a staple crop in everyone’s summer garden, and for good reason! Not only are these little fruits delicious, they also provide a ton of nutritional benefits. Add some berries to your garden for a harvest the whole family is sure to love. When growing fruits in your organic garden, be sure to use Espoma’s liquid plant foods to give you healthy blooms and abundant fruit. Blueberries pack a big punch for such a small fruit. They are loaded with tons of vitamins, essential nutrients and antioxidants. Blueberries are often a favorite among kids, too. What better way to get kids involved with the garden than by planting something they love? Blueberries also thrive in containers, making them the perfect fruit for small space gardeners. The beautiful foliage they produce is just an added bonus. Try using Espoma’s Holly Tone plant food, perfect for acid-loving fruits like blueberries and strawberries. Another fan favorite, strawberries are well-loved for their versatility. While delicious on their own, they also pair well with so many different flavors. They can be used in anything from sweet pies and homemade jams to a tasty vinaigrette dressing. Whether snacking, cooking or baking, there’s no way your strawberries will go to waste! Strawberries grow best in soil with a pH level of 5.5-7. If your pH level is too high, use Espoma’s Soil Acidifier to create the perfect growing environment. The sweet summer flavor of raspberries makes a great addition to any dessert. Raspberries often grow up instead of out, so make sure you plant with support stakes or next to a fence. A tall raspberry plant looks beautiful in any garden and draws all eyes to the beautiful red and green foliage it creates. Since they don’t produce fruit the first year of planting, blackberries require a bit of patience. However, with great care we promise it will be worth the wait! When blackberries are ready to harvest, the flavors pair very well with raspberries. Blend together in a smoothie or bake a mixed berry pie and enjoy the taste of summer. Want to know more about growing your favorite berries? Check out our infographic! Berry Healthy Recipes, Straight from the Garden! There’s nothing more refreshing than the taste of summer berries, and in August your berries are still prime for picking! Many berries ripen around mid-summer, so by now you already may have some practice with harvesting. Now that summer is starting to wind down, try these new recipes to prolong that sweet seasonal freshness. Blueberries: Don’t pick them until they’re fully ripe! Wait until they turn a uniform color and can easily be pulled away from the plant. But don’t rely on color alone; check first if the berries are firm, rather than mushy. Store them in the refrigerator after you’ve collected them. Strawberries: Keep the cap and stem attached. Store in the refrigerator for 2-5 days. Raspberries: When ripe, raspberries are easily removed from the plant. Refrigerate immediately and use between three and five days after picking. Harvest every few days. Check soil pH. If your soil is not acidic enough, add Espoma’s Soil Acidifier. Blackberries: Don’t pick blackberries too early! Wait until they dull in color from the black, glossy stage. Pick ripe blackberries every 3-6 days. For more information on taking care of your organic garden, check out our Berry Growing Guide! Once you’ve collected your berries, take them to the next level with these easy and delicious recipes! Slow cooker granola berry crisp: A perfect summertime dessert, made with your choice of berries from the garden. This recipe is light, fresh and healthy—a true seasonal staple! Summer berry cheesecake salad: With just five ingredients, this recipe combines the sweetness of berries with all the great flavor of cheesecake filling. Makes for a sublime summer fruit salad! Red berry vanilla almond smoothie bowl: Great for breakfast (or any other time of the day), this treat is fewer than 300 calories and takes five minutes to make. It’s a great way to add an extra summery punch to your regular breakfast routine. Summer berry kale salad: This summer salad, combines signature vibrant and tropical flavors in one quick, easy dish! Berry watermelon fruit salad: A classic take on combining peak season fruit. You can make this fruit salad well into September. Bonus tip: add a light sprinkle of lime juice before eating! Mini summer berry galettes: You’ve already got your berries ready to go! Just fold your fruits into the pie crust and bake. Now you’ve got a healthy, sweet summer treat! What is your favorite way to prepare fresh berries in the kitchen? Try any of these recipes and want to show us a picture? Share your experience with us on our Facebook page! https://www.espoma.com/wp-content/uploads/2016/08/strawberries-1567319_1920.jpg 1111 1920 Jourdancole https://www.espoma.com/wp-content/uploads/2018/11/espoma-organic-logo.png Jourdancole2016-08-16 08:00:352019-01-31 20:14:53Berry Healthy Recipes, Straight from the Garden! Strawberries are a favorite summer fruit. Yet store-bought berries can’t come near the intense and fresh flavor of those picked right off the vine from your very own garden. Packed with Vitamin C and fiber, strawberries make a great nutritious and delicious snack. Eat them alone or add to jams, pastries and smoothies. Find out how you can get the most out of this year’s strawberry harvest. Runners are long stems that “run” off the main strawberry plant to create new plants. Some are good but too many left unkempt will draw nutrients from the main plant and cause it to stop producing fruit. Snip excess runners off at the base of the plant. Encourage wanted runners to root by gently pressing the end of the runner into the soil. Strawberries are especially susceptible to a gray mold known as Botrytis that makes berries rot. Remove affected leaves and fruit ASAP to prevent further spread. Keep fungi at bay by planting strawberries in a sunny spot and only watering at the base of the plant in the morning. A layer of straw mulch will also reduce fruit rot. Strawberries love warm weather, but berries suffer once temps rise above 85 degrees. Give them some shade by using row covers that can be found at your local garden center. Encourage strawberries to grow by adding Espoma’s Holly-tone, an organic plant food perfect for these acid-loving plants. Check the soil to make sure it’s loose and at an ideal pH of 5.5 to 7. If the pH level is too high, add Espoma’s Soil Acidifier for ideal soil conditions. Now just sit back and wait to enjoy the harvest! To learn more about organic berries, be sure to check out our ultimate berry growing guide! There’s nothing like fresh-picked blueberries to add to a smoothie, salad or dessert. Rich in many health-benefiting nutrients, anti-oxidants, and vitamins, blueberries don’t just taste delicious, they’re also nutritious. The secret to grow delicious, thriving blueberry plants: feed them, a lot. Maximize your blueberry bushes’ health, help it resist insects and diseases, and boost your harvest by providing the right kinds of soil amendments. Fertilizing is recommended in early spring before the leaves have grown in. This gives the fertilizer time to be absorbed by the roots of the blueberry before it enters its active growth stage during summer. Feed new plants once in early spring and again in late spring. Healthy, established plants should not need to be fed more often than once a year. 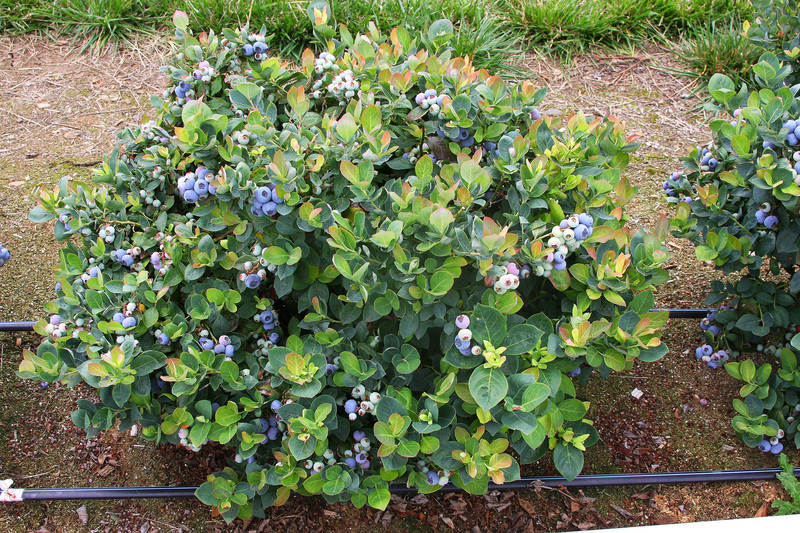 Blueberry bushes respond best to acid fertilizers such as those for rhododendrons and azaleas. Holly-tone has long been used by professional gardeners as the best source of food for berries. From blocking weeds to conserving water, mulching goes hand in hand with fertilizing and is also very important for blueberry bushes. By feeding as it decomposes, mulch helps to maintain soil acidity. The best mulch options are oak leaves, pine straw or pine bark. Gardeners should spread it in a 3-4” thick layer. For established plants, spread one cupful of Holly-tone per foot of branch spread. Double the quantity if branch spread is 3’ or larger. If the area to be fed is mulched, remove as much mulch as you can, feed, and then restore the mulch on top of the plant food. If you can’t remove the mulch, just double recommended feeding rates. To lower the pH of soils for optimum growth of acid-loving plants such as blueberries, you can also mix in Soil Acidifier as needed. Always water well after fertilizing. To learn more about blueberries and how to plant, care for and grow, visit our Organic Blueberry Growing Guide.